Richard Kenefake was evidently a man of some substance for his grave is marked by a large stone inscribed "HERE LYETH THE BODY OF RICHARD KENEFAKE WHO DEPARTED THIS LYFE THE 11 OF AGVST 1712". (See photos below). The Carrigaline area was part of the Boyles' family estates. 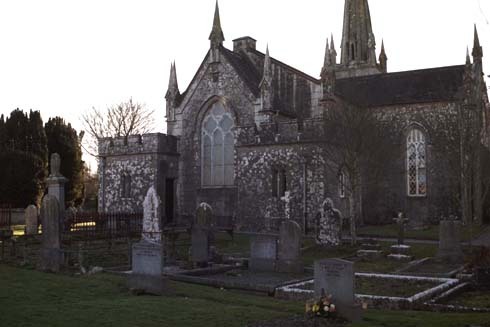 Lord Shannon, head of the Boyles family, was actually in residence in Carrigaline parish in 1712, at Shannon Park or Ballinrea. Since the name Kenefick must have come from the Castlemartyr area, Lord Shannon's main residence, you can bet that Richard came from there in Lord Shannon's service. He may have been a "driver," the person who collected the rents from the Irish tenant farmers on Lord Shannon's estate or some other intermediary between Lord Shannon and the Irish people. 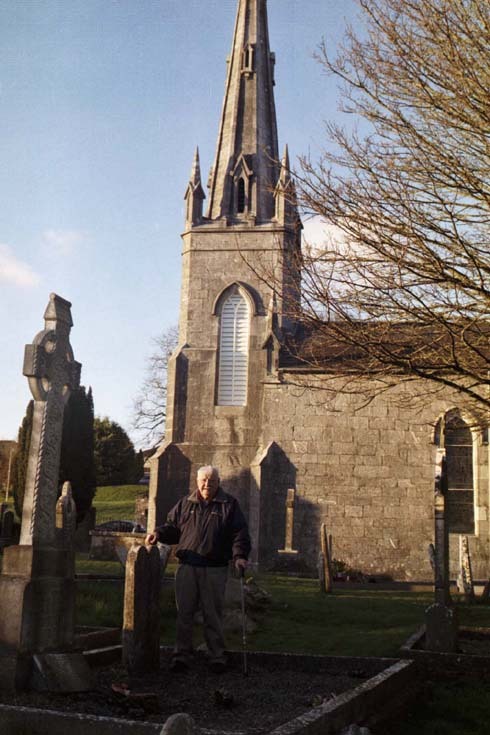 Bill Diederich standing beside the gravestone of Richard Kenefake in St. Mary's churchyard in Carrigaline, County Cork. Rear of St. Mary's church at Carrigaline. Gravestone of Richard Kenefake, who died 1712. Note the lichens and other mold. 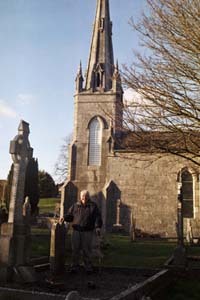 Richard Kenefake's gravestone at St. Mary's in Carrigaline. Most of the inscription can be read in the enlarged photos.